The Borexino neutrino detector is located at Italy's Gran Sasso National Laboratory, about 5,000 feet (1.5 km) under Gran Sasso Mountain. The instrument detects anti-neutrinos and other subatomic particles that interact in its special liquid center, a 300-ton sphere of scintillator fluid surrounded by a thin, 27.8-foot (8.5-meter) diameter transparent nylon balloon. This all “floats” inside another 700 tons of buffer fluid in a 45-foot (13.7-meter) diameter stainless steel tank immersed in ultra-purified water. The buffering fluid shields the scintillator from radiation from the outer layers of the detector and its surroundings. Billions of ethereal particles known as neutrinos pour through us every second from the sun. Lately, scientists have realized that these mysterious entities do possess mass, albeit a small amount, despite previous predictions that they had none. Now a giant scientific experiment housed deep beneath mountains in Italy is analyzing neutrinos from the sun with unprecedented detail, which might one day help solve the enigmas neutrinos pose, as well as shed light on the inner workings of stars. Neutrinos are generated by nuclear reactions and certain types of radioactive decay. They are created in great multitudes in the nuclear furnace of the sun, flowing through Earth's surface in numbers as high as 420 billion per square inch (65 billion per square centimeter) per second. However, they have a neutral electrical charge and almost never interact with other particles, which means they stream through regular matter virtually unaffected, only rarely slamming into atoms. The new findings come from the Borexino experiment buried under the Apennine Mountains at the Gran Sasso National Laboratory in Italy, one of the most sensitive neutrino detectors on the planet. Scientists had accurately predicted the properties of nearly all the subatomic particles that make up our universe with a theory that had long suggested that neutrinos were massless. However, starting in the late 1990s, researchers discovered that neutrinos actually had mass, albeit a vanishingly small amount. It remains a mystery as to why neutrinos are so lopsidedly smaller than every other known particle — they are about 500,000 times smaller than the electron — one that hints at new science and potentially a zoo of as-yet unknown particles to discover. The Borexino experiment instrument uses 2,200 sensors to detect neutrinos in the exceedingly rare instances they interact with about 300 tons of a special organic liquid. All this is housed at the center of a large sphere surrounded by about 2,000 tons of pure water. "We are exceeding the design sensitivity of the detector, which at its onset seemed almost impossible to reach," researcher Andrea Pocar, a physicist at the University of Massachusetts, Amherst, told SPACE.com in an email. "The primary reason of Borexino's sensitivity is its unprecedented radiological purity — that is, ultra-low level of trace radioactivity contamination. The central 300-tonne liquid scintillator target has a content of uranium-238 and thorium-232 which is hundreds of billions times lower than in 'regular' dust — typical concentrations are around 1 part per million by weight in common materials and soils." Altogether, the purity of this organic liquid, along its protective layer of water and the mountains above it, maintain its core as the site most free of trace radiation on the planet. This helps ensure that almost anything it detects is in fact a neutrino. Although Borexino can detect neutrinos from sources on Earth, such as nuclear reactors, the international team of nearly 100 physicists, engineers and technicians from Italy, the United States, Germany, Russia and France working at Borexino is focused mainly on neutrinos from the sun. "Borexino is the only detector capable of observing the entire spectrum of solar neutrinos at once," said researcher Laura Cadonati, a physicist at the University of Massachusetts, Amherst. The solar neutrinos Borexino detects include those from the radioactive decay of beryllium-7 (7Be) atoms. These product neutrinos are predicted to make up about 10 percent of the mass that flows from the sun. These low-energy particles were below the observable threshold of past detectors. Borexino also investigated the odd phenomenon of neutrino oscillation, which underlies their mass. Neutrinos come in three types, or "flavors" — electron, muon and tau. As they zip through space, neutrinos change or "oscillate" from one flavor to another, and their mass arises from these transformations. Earlier instruments in Canada and Japan designed to detect higher-energy neutrinos had already seen evidence of their flavor oscillations, probing 1 ten-thousandth of the solar neutrinos streaming through Earth and their oscillations. The new data from Borexino on lower-energy neutrinos now help confirm that solar neutrino oscillations are energy-dependent — lower-energy solar neutrinos are more likely to come in the electron flavor than higher-energy ones. "The data confirm the neutrino oscillations, flavor changes and flow predicted by models of the sun and particle physics," Cadonati said. The researchers also found no difference in the flow of 7Be neutrinos between day and night. Some scientists had suggested that a disparity might exist because at night, the Earth's bulk comes between the sun and Borexino. "The traverse through the earth seems not to change neutrinos' flavor," Pocar said. Overall, these findings help exclude more exotic explanations for neutrino oscillation than currently exist. These include models in which neutrinos can decay into as-yet undetected particles, new ways for neutrinos to interact with regular matter and oscillations into so-called sterile neutrinos that interact with regular matter even less than ordinary neutrinos, Pocar said. In the future, the scientists hope to identify the origin of every type of neutrino coming from the sun. This can help assess the relative levels of carbon, nitrogen and oxygen there, deepening our understanding of how the sun evolved and how its workings compare to that of larger stars. "The carbon-nitrogen-oxygen fusion cycle is supposed to be the dominant one in heavier stars, and detailed understanding of how it works in the sun would impact the way we quantitatively understand all other stars," Pocar said. Neutrino detectors are the only way scientists have of directly imaging the core of the sun, as only neutrinos can escape essentially undisturbed from the dense solar core, Pocar said. 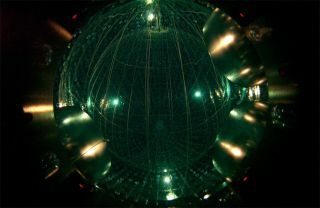 "Borexino is using neutrinos to explore the interior of the sun, looking for new, exciting clues to the mysteries of the universe we cannot see," Cadonati said. The hope remains that Borexino could detect a new kind of neutrino from the sun, one that could help shed light on the mystery of these particles. "You always have the hope of seeing surprises, some small deviation from the expectations," Pocar said. "The solar neutrino oscillations model will be put to even more stringent test in the hope of finding small but convincing deviations from expectations, which could reveal the sign for new fundamental physics." The scientists detailed these findings online Sept. 30 in the journal Physical Review Letters.